Dave Patterson worked with the Cardinals' roving hitting instructor in 1993 and it seemed to pay off, according to The Louisville Courier-Journal. It paid off with a two-home-run game, The Courier-Journal wrote. "We did some soft-tossing, working on getting my front arm through," Patterson told The Courier-Journal of his work with the instructor. "I guess it trained my brain a little." Patterson made those improvements in his eighth season as a pro. He'd seen AAA in each of his previous two seasons and played that season at AAA Louisville. He couldn't improve his hitting enough to make the majors. Patterson's career began in 1986, taken by the Giants in the 14th round of the draft out of the University of Arkansas. At Arkansas, Patterson showed his prowess with both the long ball and the short ball. He hit a grand slam in an early April 1986 game and then hit five singles in a game later that month. With the Giants, Patterson started at short-season Everett. He hit .305 over 56 games there. He went 2 for 4 in a July game. He moved to single-A Clinton for 1987, then single-A San Jose for 1988. He hit .284 at San Jose, with eight home runs and 74 RBI. 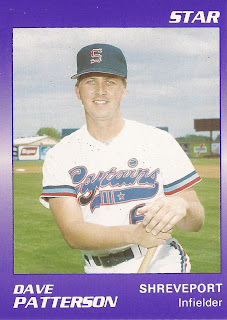 Patterson played 1989 and 1990 at AA Shreveport, then split 1991 between Shreveport and AAA Phoenix. He hit .314 in 54 games at Phoenix that year. Patterson spent all of 1992 back at Phoenix. He hit .256, with 35 RBI. He didn't see San Francisco. He moved to the Cardinals system for 1993 and AAA Louisville. In 80 games there, he hit .278, ending his career.